In SMS Plan, we will provide you SMS based alerts on Market Prices for various Polymer and daily updates on Crude, Bullion,Forex,Market trends,Projection ,Market moves, Corporate Actions,impact of global changes etc. PolymerMIS at your fingertips. This plan is for the customers with android phone or tablets. Download our free application from the play shop and gets access to the important news, prices and newsletter section. 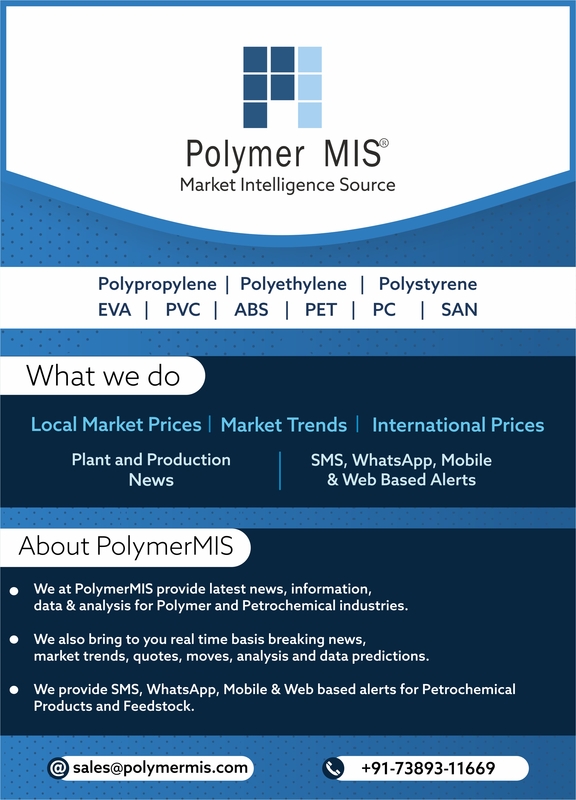 Apart from all the features of SMS Plan and Trend Plan, we will also provide you web access to our portal where you can get breaking news for the updates on polymer industry for both national and international market, instant news alerts, detailed trend analysis, technical analysis, historic data, comparison of various grades etc. Brent Crude Oil prices on the ICE Futures Exchange opened at $ 108.09. Weekly PE Updates: PE in Asia assessed lower due to low demand and fear of further fall in prices, LDPE and LLDPE prices are at one year low. Weekly PP Updates: Prices assessed lower due to weak demand in Asia, Domestic Mkt is in festive mood and Local producers ruined the sentiments by reducing the prices. Weekly PVC Updates: Prices assessed lower due to weak demand and selling pressure among Producers and Importers. PVC Market Trend: Intl reports suppose to be lower by 15-20$ and Local producers will reduce prices. Euro slipped to 8 month low against US$, EU Finance ministers meeting again to protect their banking system and clearing loan payment installments.Weakness in the rupee to continue for a while now. PP Co-Polymer from Germany quoted @ US$ 1420 per MT CIF Nhava Sheva for November shipment.